The location is only good a couple times a year. Our target fish the scribbled snapper. The water, weather, swell, tide , current were perfect for our playground to be filled with scribbled snapper. We started diving around 8 in the morning. The water visibility was perfect. I felt like a kid in a candy store. The last time i was here was 2-3 years ago, it took both me and antok some time to find the location of the cave , hole, trench and rocky terrain where the kampuh are usually found. The first kampuh i saw, i shot too low and it ripped off, then i see antok not too far heading toward me with a kampuh in his spear, telling me more kampuh on the other side. In total we saw more than enough kampuh to fill the cool box. Some are hard to shoot, some you need to go inside the cave to catch, some you just have to hold your breath and be patient. It was a lot of fun chasing them. Antok’s friend Matteo, is an expat from italy who has a few eye catching trohpy fish in his belt. His first fish was a blue trevally. 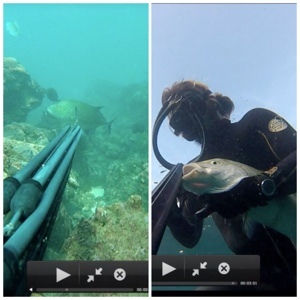 He films his dives on his gopro camera. 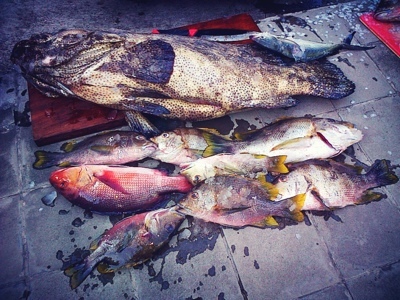 He shot a few kampuh, and a nice mangrove jack. Like every trip, either enk or antok pull a surprise. I was holding on to the jukung while doing a number 2. 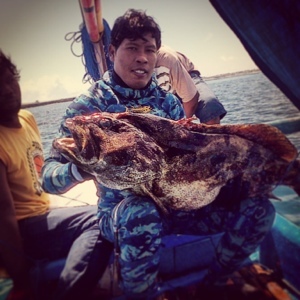 Then all of a sudden i hear a loud shout, the captain said antok caught a big fish. We quickly went to fetch antok. He shot a 15 kg grouper (flowery cod) I guess it must have been my breakfast/chum that attracted the fish’s attention. 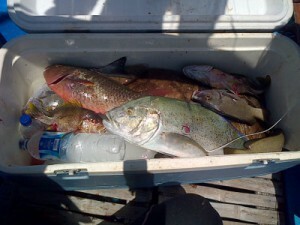 After filling up the coolbox with fish almost to the top, we wanted to try another spot 15 min away on the boat. When we dove there, It was quite sad to see what affect the 5 star hotel had on the reef infront of it. It was covered with silk and there was a flow of water coming from the hotel. Not only did the hotel look like #!%! from the ocean but they should take some responsibility, because first they take advantage of the beautiful view, so in return take care of the reef!!!! Without the nice view no big profit!!! So give some back to nature you big 5 star hotel!!!! Also u can afford to build a long peer, so plant some coral back!!! We saw some mangrove jack and scribbled snapper, a lot of sweetlip. We shot some and called it a day after seeing a big disappointment to reef ecosystem ruined by the big 5 star hotel..
To add to the highlight of the amazing day in the ocean we saw a huge healthy dugong, very playful, and a big sea turtle, some reef shark, and a lot of big grouper, spanish mackerel (unfortunately i had a fish in my spear when it passed through behind a school of queenfish) a big school of small amberjack circling around me. Could not have asked for a better day in the ocean.